Thsi antibody specifically binds to human Lipoprotein a.
Purified by a human plasminogen-Sepharose affinity column to remove cross-reactivity to plasminogen, followed by a Apolipoprotein A-Sepharose affinity column. Our Abpromise guarantee covers the use of ab27631 in the following tested applications. Lipoprotein(a) (Lp(a)) is a lipoprotein subclass assembled in the blood from low density lipoprotein (LDL) molecules and apolipoprotein-a (apo-a). Lp(a) recruits inflammatory cells through interaction with Mac-1 integrin. High Lp(a) in blood is a risk factor for coronary heart disease, cerebrovascular disease, atherosclerosis, thrombosis, and stroke. Lp(a) concentrations may be affected by disease states, but are only moderately affected by diet, exercise and other environmental factors. Lipid-reducing drugs have no effect on Lp(a) concentration. High Lp(a) predicts risk of early atherosclerosis similar to high LDL, but in advanced atherosclerosis, Lp(a) is a risk factor independent of LDL, indicating a coagulant risk of plaque thrombosis. Apo(a) contains domains that are very similar to plasminogen (PLG). Lp(a) accumulates in the vessel wall and inhibits binding of PLG to the cell surface, reducing plasmin generation which increases clotting. This inhibition also promotes proliferation of smooth muscle cells. These unique features of Lp(a) suggest a role in the generation of clots and atherosclerosis. 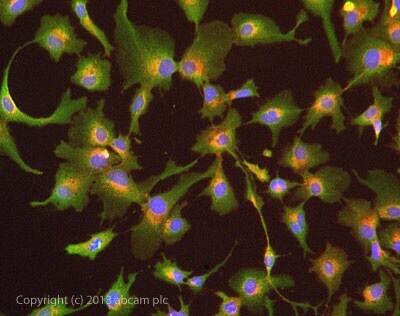 ICC/IF image of ab27631 stained HepG2 cells. The cells were 100% methanol fixed (5 min) and then incubated in 1%BSA / 10% normal donkey serum / 0.3M glycine in 0.1% PBS-Tween for 1h to permeabilise the cells and block non-specific protein-protein interactions. The cells were then incubated with the antibody ab27631 at 1µg/ml overnight at +4°C. The secondary antibody (green) was DyLight® 488 donkey anti- Sheep (ab96939) IgG (H+L) used at a 1/250 dilution for 1h. Alexa Fluor® 594 WGA was used to label plasma membranes (red) at a 1/200 dilution for 1h. DAPI was used to stain the cell nuclei (blue) at a concentration of 1.43µM. ab27631 has not yet been referenced specifically in any publications. Publishing research using ab27631? Please let us know so that we can cite the reference in this datasheet.